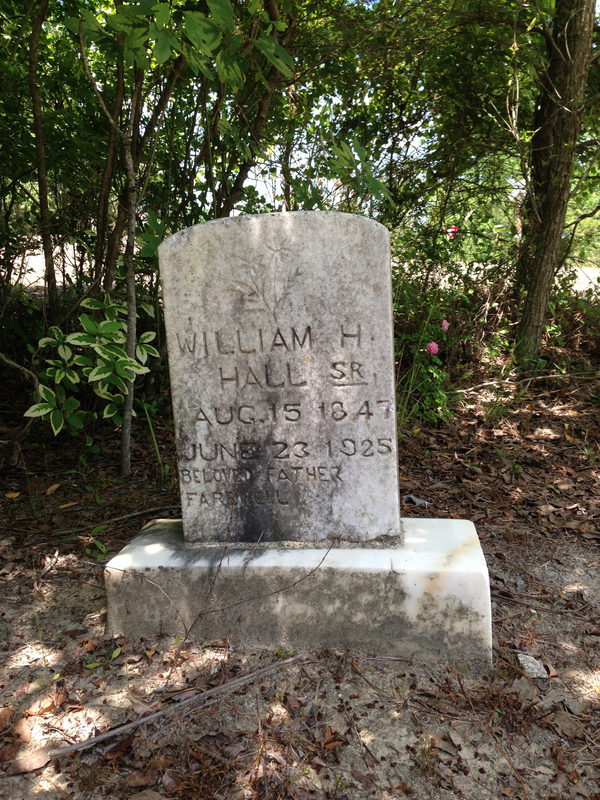 WILLIAM H. HALL, SR. was the son of Eliza Hall and James B. Woodard, a white man. He is buried in Red Hill cemetery, near Stantonsburg, Wilson County. Beloved father farewell. Photo taken by Lisa Y. Henderson, May 2013. In the Southeastern part of Lincoln county, on the 2d ultimo, a free mulatto named Thos. Taylor, committed suicide by shooting himself in the throat with a pistol. It took place at the house of Mr. Wm. Hunt. T. was a distiller by trade, and had the fever and ague some three or four weeks, for the cure of which he used spirits, without regard to the time of the fever, This, it is thought, deranged him, and during one of those deranged spells, he committed the act in Mr. Hunt’s yard, and in presence of one of Mr. Hunt’s sons. — Charlotte Democrat. Iredell Express, Statesville, 3 February 1860. We cannot come to terms. Railroad Records, Wayne County Records, North Carolina State Archives. Sad death of a respected colored citizen. Tuesday, February the 19th., Jackson Tabourn an old colored man was found dead in the woods in Ferrell’s Township, two miles above Stanhope. He had been from home and was returning at the time of his death. The cause of his sudden demise is unknown, but it thought that he died a natural death. He was a respected colored citizen and his death is to be deplored. The Wilson Advance, 20 February 1880. In the 1850 census of Nash County: Jackson Tayborne, 28, wife Mary, 26, and children Margie A., 9, Emily A., 7, Dossey, 4, and Mardecie, 2. In the 1860 census of North Western District, Wake County: Jackson Taborn, 45, farm laborer, wife Mary, 46, and children Emily, 17, Mardesia, 13, Dawson, 15, While, 9, Dane, 6, and Joseph, 3. In the 1880 mortality schedule of Nash County: Jackson Tayborn, 56, colored, died February, apoplexy. General Assembly Session Records, August-September 1861, box 1, North Carolina State Archives. In the 1860 census in Cross Roads, Wayne County: B. Locas, 50, distiller, Jonas Capps, 18, and Tilissa Capps, 16, in the household of Henderson Bridgers, 33. No occupation is listed for Bridgers, but he claimed $12,000 in real property and $12,250 in personal property. Slave Records, Perquimans County, North Carolina State Archives. May always be found at his shop on Tarboro Street, where he will be pleased [to] serve his friends and former patrons. Shaving 10 cts; shaving and cutting hair 30 cents. 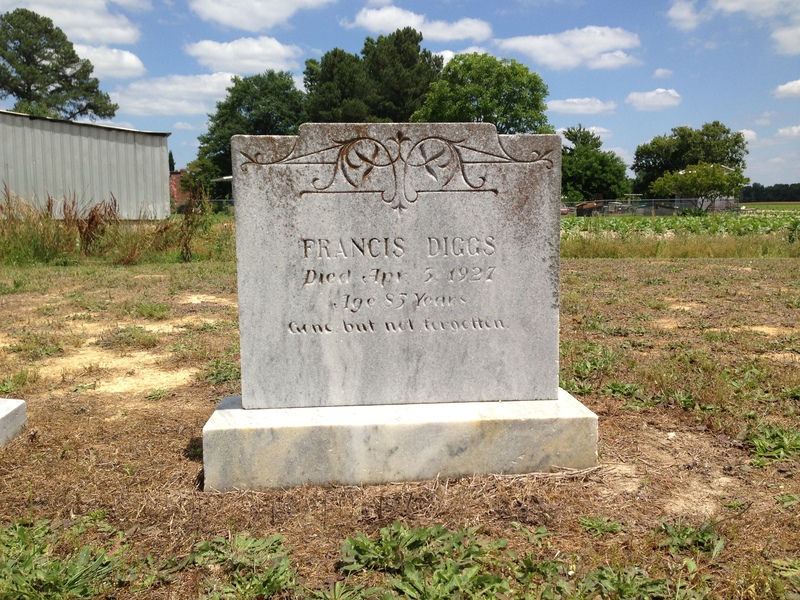 FRANCES ARTIS DIGGS was born about 1842 near present-day Eureka, Wayne County, to Eliza Artis and James Yelverton, a white man. She is buried in a small family plot on Watery Branch Road just south of Highway 222 in Wayne County. Photo by Lisa Y. Henderson, May 2013. Application for a licence for a marriage. The marriage license of Josiah Hagans and Anna Lomack of Cumberland County. 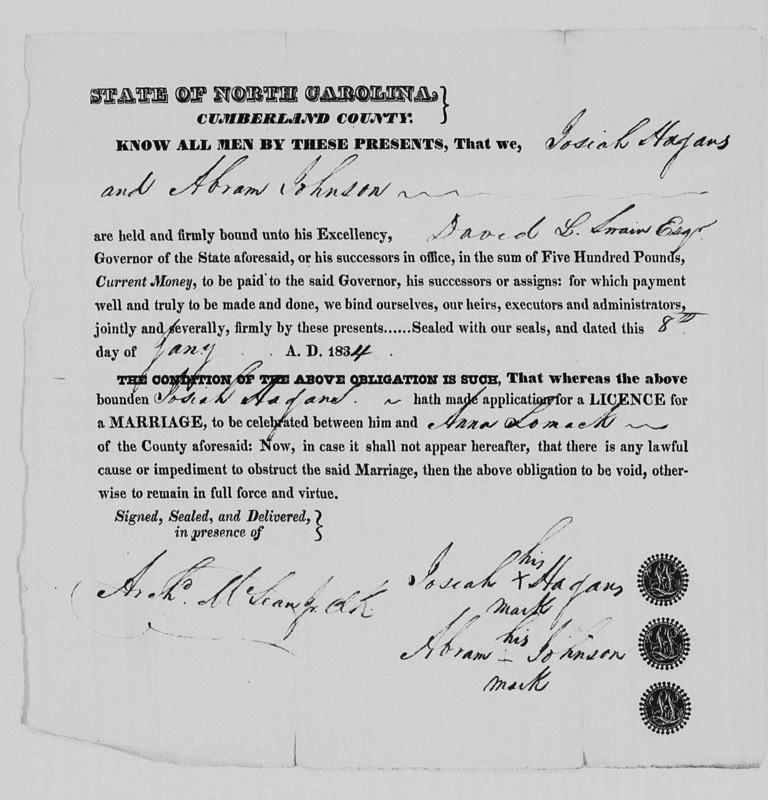 Marriage Bonds, Cumbelrand County Records, North Carolina State Archives. In the 1840 census of Cumberland County: Josiah Hagans heads a household consisting of 1 male aged 36-55, 1 male aged 55-100, 5 females under age 10, and 1 female aged 24-36; all free people of color.